Corporate gifts are quite a popular topic among businesses. When you are thinking making better marketing strategies, giving corporate gifts is one of those strategies. Corporate gifts can be given to the people working in the company or clients that are associated with the company in some way. The gifs that you give depend on your budget, size of the staff or number of people receiving the gifts and also the type of business you do. If you are a tech company it would be best if you give something technology related such as USB flash drives or other similar gadgets. Corporate gifts are great in that they serve as your marketing tools. It is totally up to you what you give people as gifts. It can be something that is more directed towards improving the bond between the employees and the company, or something that is geared more towards marketing and advertisement. Some items can kill two birds with one stone – making your employees wear branded t-shirts can be quoted as an example here. When you share such gifts with your employees you invoke loyalty. They feel closer to the company and can become more productive as a result. Furthermore, when you are conducting workshops, seminars and exhibitions, your gifts can serve as great tools of branding. Think about giving just pen holders to your clients with your company’s name on them. You could do with something as simple as ball points and pens with your company’s name on them and also the logo. This will attract your clients towards you and make them do business with you. When you distribute such gifts at exhibitions you give your clients a reason to remember you. Giving out mere information often results in a very bad response from customers. 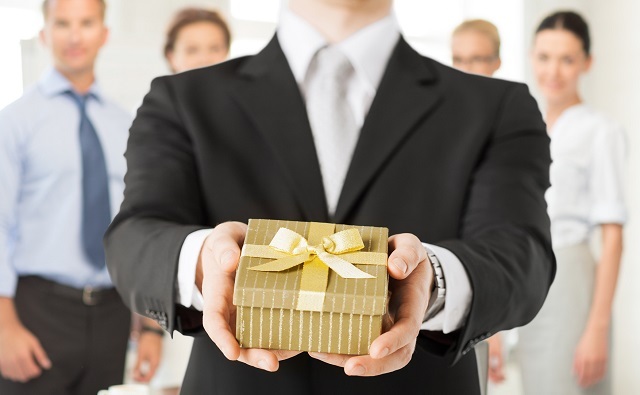 Corporate gifts can also be given to employees as a token of appreciation. For example, if the sales department was able to achieve its monthly target you could award them with branded t-shirts and a great dinner at some good restaurant. When they see the t-shirts as a sign of their achievement, they will definitely feel like wearing those t-shirts. For your female employees, you can log on to Gifts Ready to Go and find some very interesting gifts. It must be remembered here that the items you choose as your corporate gifts play an important role in building your image in the eyes of your clients and employees. You don’t have to go for expensive items but make sure your items don’t look cheap and useless.